We were lucky enough to be sent a fabulous game to review from Orchard toys, with all the wet days we’ve been having we’ve enjoyed playing board games. Often it is quite frustrating trying to play a board game with Boo when E is playing to, as at 18months he doesn’t really grasp that he mustn’t sit on the board or run off with major pieces! Head, Shoulders, Knees and Toes provided a fabulous opportunity for us to introduce E to participating in a game while still being a challenging game for Boo! The game is based on the well known children’s song of the same name, and you do actually get to sing it if you find a ‘wild card’! There are two ways to play, the first is the easy way which we’re teaching E. Simply spin the wheel and pick up a card with the corresponding colour spot. Then match the action shown on the card to the action on your game board, the winner is the first person to complete their board! The proper way to play involves guessing what the card has on it before picking it up, and you only get to keep it if you’ve guessed correctly! It soon becomes a memory game as Boo tries to remember each card he’d not guessed so he could pick it up the next time to keep it! I like the game as it teaches Boo not only about taking turns, but also encourages him to use his memory! It isn’t just a sit down quietly game, and gets quite lively but that is all part of the fun! Boo loved singing the song at the top of his voice complete with all actions and kept trying to locate the wild cards! 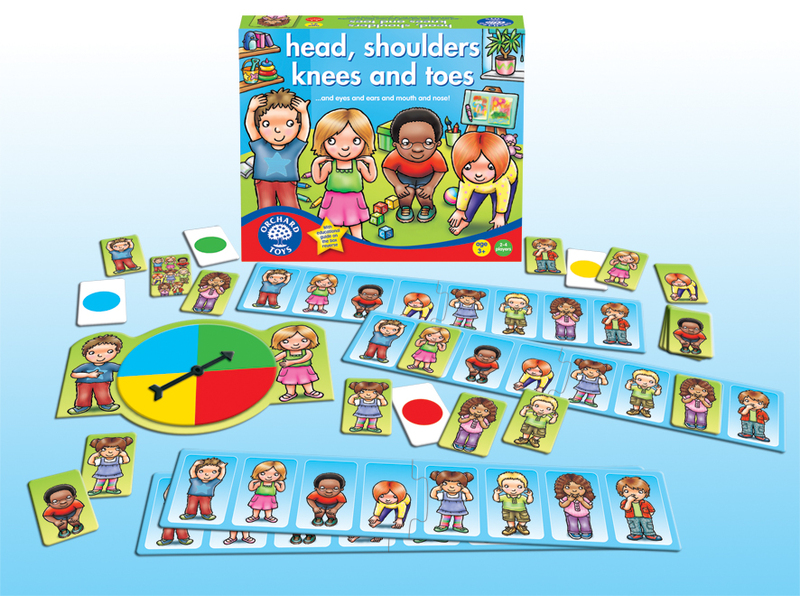 Orchard Toys have kindly offered a copy of ‘Head, Shoulders, Knees and Toes!’ as a prize for the following give away! Disclaimer: We were sent a copy of the game for the purposes of the review, all opinions are my own. Previous PostArt Attack is back and with Disney makes!Next PostTeething, biting, tantrums and tears…mostly mine. Thanks for this lovely review, we’re so glad that your family had fun playing Head, Shoulders, Knees and Toes. Even the little one! Great British Summer – ideal for playing Orchard Toys games or assembling a jigsaw …. out of the rain. Love the Shopping List game, Grace is into her play shopping, so this looks perfect as an extension on something she loves doing. I like the In My House jigsaw puzzle. So sweet. With all this rain, we have spent most afternoons playing games .. We Love all the Orchard Games – but our fave at the moment is Pop to the Shops … Fantastic review of Head, Shoulders, Knees and Toes …cant wait to get one and have a go ourselves ..
My favourite from the Orchard Toys Website is the ‘Greedy Gorilla’ game. I think the Run, Run as Fast as you Can! looks great fun. We also love the shopping list game!